I am linking up with Kacey at Doodle Bugs Teaching for my first Five for Friday party. So here are my 5 random things from this week or today. 1. This week was filled with testing! I spent last weekend trying to get organized for testing and I plan on spending this weekend organizing the data I collected. Stay tuned I am hoping to post some pics tomorrow of my data sheets and binder. 2. Got a text from the hubby today that said "call me asap". You know that is NEVER good! Luckily it was lunch time so I called him right away. Turns out he was at my kids school because my kinder daughter ran into another kinder head first on the playground and her mouth was bleeding A LOT and 3 of her teeth were loose!!!! So I called the dentist and the hubby took her over there right away. She has all her teeth for now but will probably loose 1 or 2 of the front ones. Luckily they are baby teeth and when they took the x-ray her permanent teeth have moved down so if she looses them hopefully the replacements will grow in quickly. Now she has to eat soft food for 5 days, she hoping for nothing but mac and cheese and ice cream! 3. We managed to squeeze in some fun stuff around testing this week and my kiddos loved making this walrus I found on pinterest. Click on the picture to take you to the website with the directions. I added a sheet where the kids wrote a fact they learned about walruses. They cut out and glued the sheet on the back. Click here to get your free copy of the sheet. 4. Looking forward to getting back to a regular schedule next week! New guided reading groups and all! 5. Had to disinfect my room A LOT this week. We have had all kinds of yuck going around, from flu to strep! Including one of my kiddos throwing up on the keyboard while we were testing in the computer lab! Hopefully next week everyone will be healthy!!!! TGIF!!! Hope everyone has a great weekend! So glad that I found your blog- I am looking forward to following you. 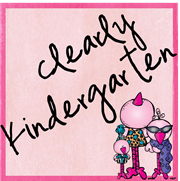 I love to find new kindergarten blogs. I know how you feel with all the testing. It is a bit much:( I would love for you to stop by my blog sometime! Will do thanks for stopping by! Your poor little thing! I hope she was ok! How is her mouth?! I loved the walrus activity - so cute! Thanks for sharing the freebie. I can totally relate to the disinfecting, I feel like I'm constantly wiping things down with my trusty Lysol wipes. Those kids sneeze and cough on everything! Aww thanks for asking! She is getting better, one more day of soft food. It seems like two of the teeth will tighten back up, one might stay loose and fall out. Oh well at least they are baby teeth and she doesn't seem to be bothered by it! Gotta love resilient kids!! My son fell down the stairs about a week before he started kindergarten. We didn't know it at the time, but it knocked his front teeth loose just enough that they started dying. He had to have them both pulled at the end of the year of kindergarten. He is now in second grade and his permanent front teeth finally grew in this year. At least your daughter won't have to go long with hers it sounds like. That walrus is ADORABLE! I am teaching about walruses next week so I am going to go to that site. This looks like a much easier walrus than the one I did last year. I am excited to be a new follower of your blog!